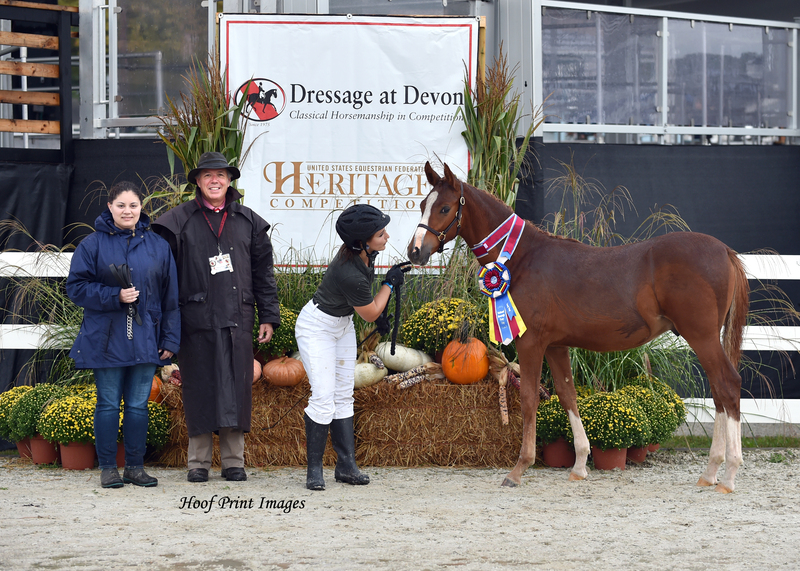 Devon, PA – The largest open breed show in the world is taking place at Dressage at Devon from September 25 – September 27. More than 20 breeds of horses and ponies of all shapes and sizes were in the ring Tuesday competing for the best of their breed. They were judged on movement, conformation and general impression. For the first time, Dressage at Devon, also held classes just for ponies, who are classified into breeds just as their larger peers. “We were very pleased with the response to our new pony classes. Ponies were always allowed in the breed classes but this provided a new opportunity for pony breeders and owners,” said Melanie Sloyer, Chair of the Breed Division. Classes included Pony Fillies of the current year, Pony Colts/Geldings of the current year, in addition to yearlings, two-year-olds, plus four-year-old classes. The Pony Foal Championship was won by Branley Ash Nautilus (by the German Riding Pony stallion FS Numero Uno out of Georgina/Dornik B), a Weser-Ems a foal of the current year, owned by Samantha Kidd of Carthage, NC, and bred by Christine Baker. The Dressage at Devon Breed Show continues through September 27.